Ideally suited for water and waste water applications, Cornell’s patented Cycloseal (U.S. Patent # 5,489,187) is a self-contained single mechanical seal with a dished backplate. This configuration requires no external flushing and eliminates the need for a water flush line. The Cycloseal uses stationary deflector vanes cast into the pump backplate in conjunction with contoured impeller back vanes and a dished backplate to create pressure gradients that moves solids and entrained vapor away from the seal faces. 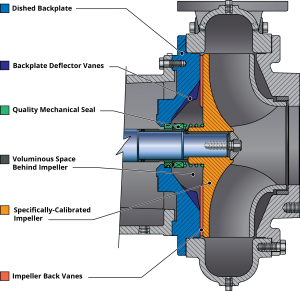 The service life of a Cycloseal mechanical seal can be as much as 10 times longer than a typical mechanical seal. 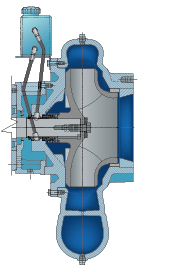 Cornell Pump Company’s distinctive frame design incorporates mounting surfaces rather than mounting feet. Look for the angular frame to know that you have a genuine Cornell frame. Cornell bearing frames are designed to support the heavy-walled castings and robust construction of Cornell pumps. Cornell Redi-Prime pumps are designed with oversized suctions to provide more flow, reduced friction losses, and higher suction lift. The priming system was designed with the environment in mind. 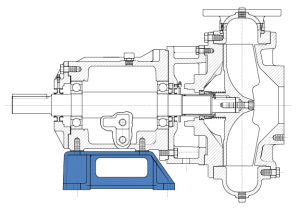 By using a positive sealing float box and a diaphragm vacuum pump, there is no water carry-over to contaminate the environment. With suction lifts of up to 28 feet, heads to 800 feet and flow rates exceeding 20,000 GPM, most Cornell pumps can be readily fitted with the Redi-Prime system. For applications where there is the possibility of the pump operating in a dry condition, Cornell’s Run-Dry system is the answer. Cornell’s Run-Dry system consists of an auxiliary gland and oil reservoir that keeps the seal faces lubricated and prevents dry running of the seal faces during priming, re-priming, or standby operation. 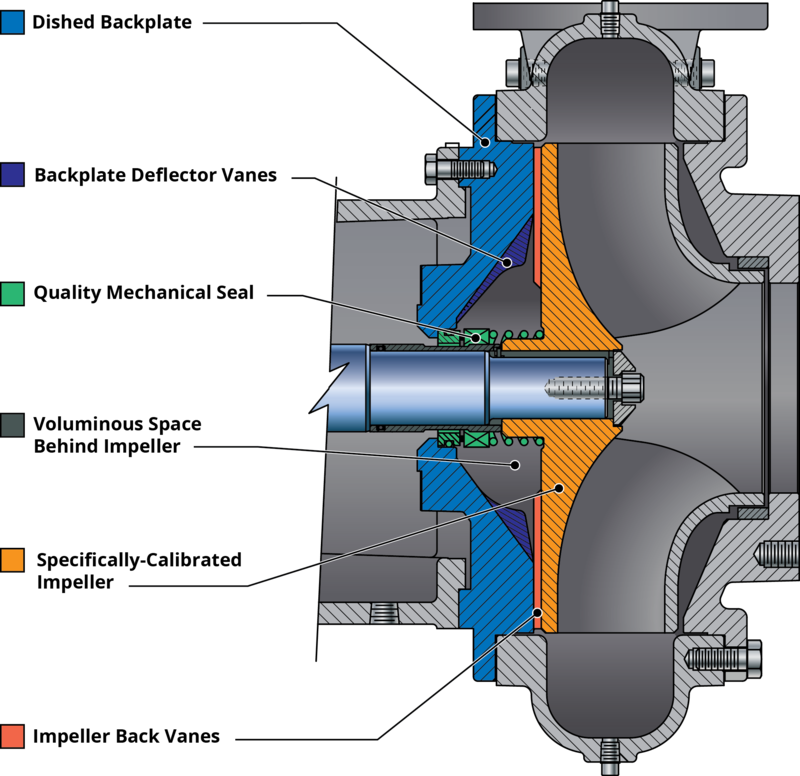 The Run-Dry gland is connected to a lubricant reservoir via inlet and outlet lines such that shaft rotation provides continuous circulation and cooling of the lubricant and seal faces. 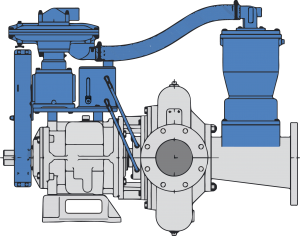 With the Run-Dry system your pump can run dry for hours without damaging the mechanical seal.